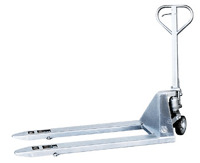 Galvanized, Zinc and Chrome Plated - Designed for corrosive or wet environments these full featured pallet trucks were designed for chemical, pharmaceutical and wash down. Stainless Steel and Stainless Steel Frame & Forks Ideal for sanitary, pharmaceutical, medical, food and wet environments. 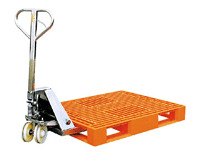 Choose either 304 stainless steel pallet truck for long life in even the most harsh environments.